This gallery is about a Becker 2 weight mechanism that had stumped at least one other repairman. When I took the mechanism apart I saw all the signs of a mechanism that had been "tuned" to make up for week trains - the springs on the strike-train levers were set so they didn't quite touch the levers they were meant to actualize (I suspect a repair person at some point figured the less spring tension, the less strain). Naturally all the gear teeth were oily, as was the entire mechanism. And, let's see - the spring on the strike arm lever was broken off (OK, most of the Beckers used bent pieces of very thin steel which aren't all that strong, but they do serve a purpose and should be there). The face of the strike hammer lifting arm was pretty rough where it was "lifted" by the pins on the strike wheel (not uncommon, but not good), and, what I think was the underlying problem - one of the pins in the strike wheel had been replaced. I tried to shoot shots of the exceptional job that was done - note the damage to the teeth around the replaced pin, and also note that the pin has been replaced a bit farther out than the original, the stub of which is still there. Hopefully you can see the problems - I don't think these pictures are as good as they could be. While the miss-placed pin would be enough to shut down a week strike train (being farther out toward the rim of the gear would mean the hammer would have to be raised significantly higher), the damage to the tips of the teeth around it sure didn't help. Fortunately, it was pretty easy to replace the pin with an appropriate one in the original hole. Funny that, the broken off bit of the original pin popped out with just finger pressure on a stake in my bench staking tool. If the original "repair" person had pushed at it with a straight pin it would have come out. But, looking at the residual evidence, said repairer spent a bit of time doing the job badly instead. Given how much damage had been done to the tips of the teeth, I would say it is a toss up which was the bigger problem - moving the pin out farther or the interference the dings on the end of the teeth would have caused with the pinion. 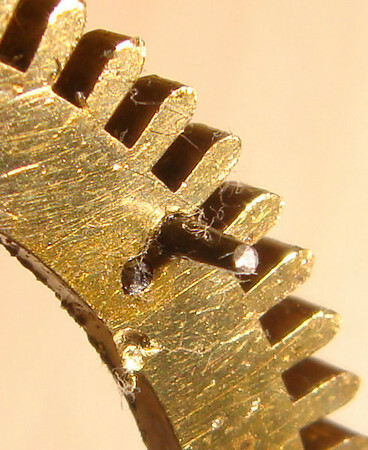 The remaining hole was drilled close enough to the rim of the gear to weaken one of the teeth. I filled the hole with a brass plug and soft soldered the pin in place. I was reticent to hard solder, in that the temperature needed for silver-solder might soften the brass, though I did use a solder with a low silver content to improve the strength. My first step in filling the hole was to use a lathe to cut a taper pin down to where the wider end of the pin would just lay flush with the surface of the gear when it is lightly pressed into the hole. I then cut the other side off with a pair of fine cutters, tapped the plug lightly with my staking set to expand the plug just a bit and flatten off the cut end. I thought it might be a good idea to give an idea of how small this project really is. Hence the shot with the tip of a pin in the picture. If you look closely in the picture with the pin you can see the rather small chip of solder that I have laid on the back of the pin in preparation for heating and flowing the solder into the gaps in the hole. It really is a very small chip of solder. I then lightly applied heat with a small torch until I just saw the solder flow into the hole, rinsed off the flux, and lightly sanded the back of the gear with 0000 Emory paper to clean up surface. While the finished wheel is not flawless – please remember – you are looking at the equivalent of perhaps 100 time magnification. To the naked eye it is absolutely perfect. Which brings me to the point of this tech tid bit. When a mechanism comes to me with evidence of previous work I always review that work under a 10 power microscope to see what "novel" repair and damage has been done. It is amazing how often just fixing the repairs and damage done by a previous repair person will eliminate problems in a mechanism.